DON'T LET THE STOCK MARKET CONTROL YOUR FUTURE THAT YOU'VE WORKED SO HARD FOR! Don't Let The Stock Market or I.R.S. Control Your Retirement! When it comes to financial planning and advice, you don’t just want to pull out your phone, type “financial advisor near me,” and drive to the closest result. You’ll want to look for somebody who is qualified, competent, and who has experience and results to back it up. You need not look further than Mark Kennedy and his team for these qualifications. 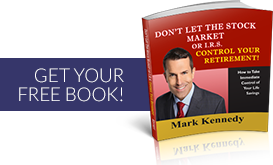 Mark Kennedy has been in the business of financial planning for over two decades, and has made quite a splash over the years. He has published a book, performs public speaking on the regular, and has been interviewed by numerous prolific news organizations, such as ABC, CBS, Smart Money Magazine, and the Los Angeles Times. While Mark Kennedy is the main face of our wealth management firm, he is also aided by a highly qualified team of professionals that have been hand-picked due to their exceptional skills and proven competence. When you work with Kennedy Wealth Management, you’ll have the assurance that every single member on our team has your best needs in mind. There are so many reasons to call a financial advisor. Whether you want to work yourself out of a bad position, or you’re already in a good spot and simply want to ensure you have the brightest future possible, Kennedy Wealth Management is here to help. We’ve served clients in Calabasas, Malibu, Woodland Hills, and other surrounding areas in Southern California. © 2017 Kennedy Wealth Management - All rights reserved.